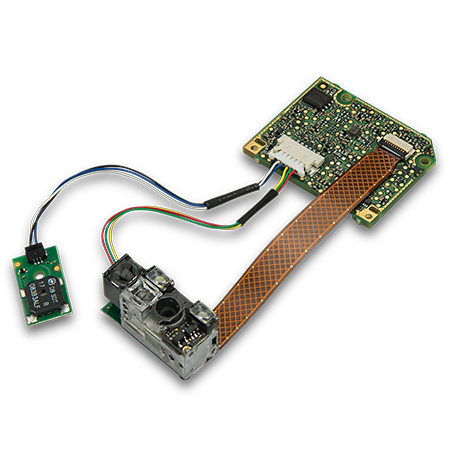 The DSE04X1 are the decoded versions of the DE2011-DL ultra-compact high performance 2D imager scan engine. The DSE04X1 are the decoded versions of the DE2011-DL ultra-compact high performance 2D imager engine. They are comprised of the DE2011-DL and a decoder board. The scan engines feature an exceptional high-speed sensor which enables image capture at a full 60 frames per second, delivering outstanding motion tolerance. The scan engines provide an outstanding depth-of-field, a large field-of-view, high motion tolerance, snappy reading, and excellent decoding performance on poorly printed codes or bar codes displayed on mobile devices and computer screens. Customers can also choose to add a beeper and/or Datalogic’s patented ‘Green Spot’ technology for good-read feedback. This is particularly useful in noisy environments. 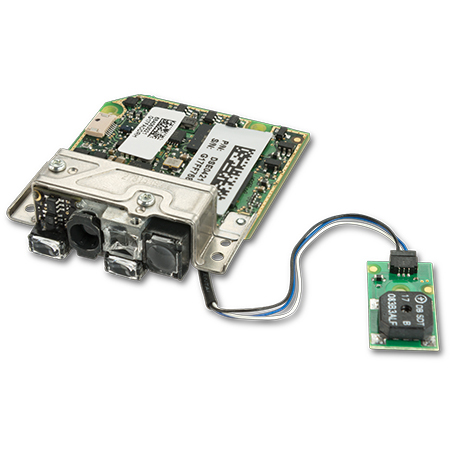 The compact size of these scan engines allow turnkey integration into a wide array of application systems requiring barcodes to be read. These include customer-facing kiosks, medical test equipment, small-footprint sorting stations for merchandise or documents. Anywhere a barcode needs to be ready and a standard scanner is not practical to be used.